Disney World’s Animal Kingdom welcomed Willow, a one-year-old giraffe calf, on Tuesday, October 12, 2010! 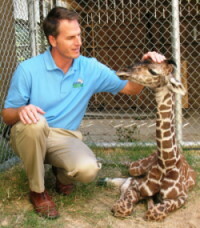 Willow was transferred from the Virginia Zoo to Disney’s Animal Kingdom based on the recommendation of the Association of Zoos and Aquariums (AZA), a national committee of experts who make recommendations for placement of specific animals to ensure high-quality genetic management for animal populations. At Animal Kingdom, Willow will join a herd of seven young Masai giraffe. This herd will eventually be released into the Kilimanjaro Safari Ride area, where they will form a new breeding nucleus for the species.